Top Tips for Maintaining Hardwood Flooring With Dogs. 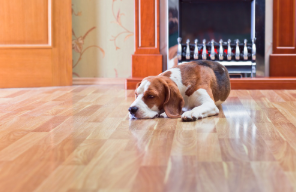 Many people seem to believe that dogs and hardwood floors do not mix. We are here to try and dispel some of that thinking. We’ll prove that with a little forethought and some tips and tricks, your hardwood floor can be a happy home for you and your four-legged friends. In this blog, we will break down how you can maintain your flooring and protect it from your pets. The first part will cover how to guard the floor itself from being damaged by your dog. In the second section, we will go over a few pet maintenance tips that will additionally protect your flooring. For many of us, the reason for maintaining our floors is because we are introducing a new family dog to our existing hardwood-floored home. In some cases, you may be putting hardwood flooring into your home when you already own a dog. In these situations, it is recommended to choose from a few types of select hardwoods that are more pet-friendly. 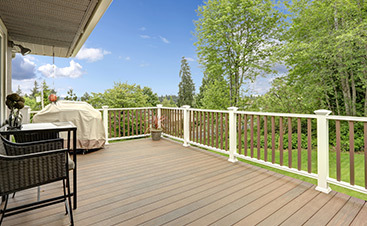 These options are all great examples of strong-grained woods that are resistant to damage. This does not mean that they won’t dent or scratch, but they are a better choice than softer woods like pine, cedar or bamboo. Distressed woods have the benefit of being relatively popular in the West. You can find them in much of the South as well as many rustic homes throughout America. Due to their already dented and worn appearance, any scratches that the wood does get are hard to notice and blend right in, thus adding character. If you are bringing your new dog home to hardwood flooring, there are some things you can do to prepare your house in advance. The following tips will help protect your hardwood and keep it looking beautiful for a long time to come. Placing throw rugs around the home in high traffic areas like doorways and hallways will go a long way toward protecting your floor from your pet. These are the areas where your pet is more likely to run or scratch their paws. Additionally, pet beds in locations where your pet may frequently lay down for a nap are helpful as well. These are often spots where your dog paces several times before lying down. 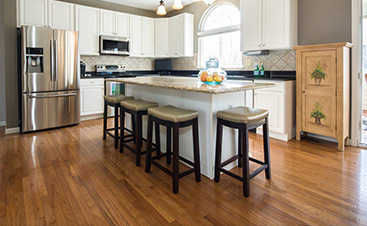 Using finishes that provide a more resilient bond will help protect your floor from scratches. These products tend to be more expensive than standard finish, but it’s far cheaper than what it would cost to sand and resurface the hardwood flooring. This kind of oil is another option if you don’t want to apply several layers of finish. Penetrating oil provides a more natural look than finish does. The downside is that penetrating oil requires considerably more maintenance. To maintain penetrating oiled floors, you will need to resurface it at least quarterly for touch-ups. One benefit of penetrating oil is that you can spot touch-up portions of your floor. This enables you to target the exact place where scratches may have occurred. Also unlike finishes, you do not need to layer your entire floor when applying penetrating oil. When you do inevitably discover a scratch on your floor, it’s not the end of the world. Many of them can be removed. Once you’ve found marks, there are a few things that you can do to help return your floor to normal. 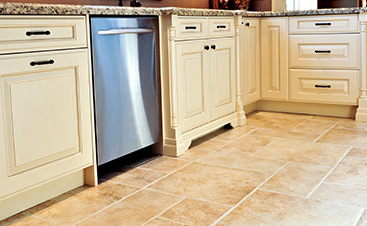 Here are some quick steps to take when attempting to remove claw marks and dents, based on the kind of floor you have. In either case, if the scratches don’t come up we recommend seeking out a professional flooring company for further advice. The following are a couple of simple things you can do for your dog to help further prevent scratching from your four-legged friend. Mats and raised food bowls help preserve your floor by protecting against spills as well as other messes that your dog will make during dinner time. Mats protect the floor from wetness soaking into the wood. This allows you to clean up after your loved one worry-free. A puppy manicure is one of the best preventive methods to protect your floor from dog damage. Untrimmed nails on active dogs will scratch your floor no matter which of the above options you choose. Well-trimmed nails will add to the life of your hardwood for years to come. Keep in mind, however, that even trimmed nails will slightly scratch your floor on occasion. It’s always important to remember that dogs and hardwood floors will inevitably end up scratched. Stay positive and be on top of the worst of the damage and your floor will look beautiful for a long time.